Last month, in September, I traveled to Thailand and Myanmar alone. I learned how to ride a baby motorbike (electronic bicycle) and climbed to the top of an empty temple with a cut on the bottom of my foot I got from stepping on glass in Orange County, California. 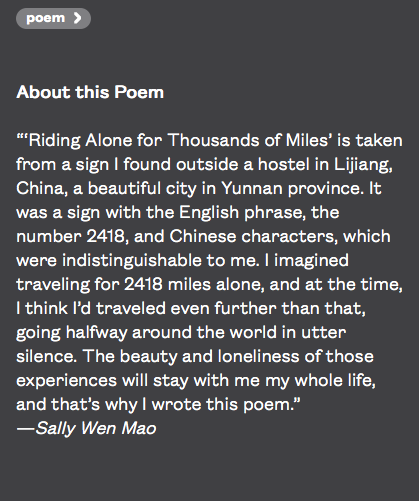 The day after I returned, the Academy of American Poets put up my poem, "Riding Alone for Thousands of Miles", as part of their Poem-a-day. A coincidence? That after returning from riding alone for thousands of miles, there my poem was, looking back at me, looking back at the world. The poem comes from another long journey, one that actually included Singapore, back in 2012. You can read it in the below link. Thank you, Academy of American Poets.